The murders of nine Emanuel AME Church members by an apparent race warrior, who sat through a Bible study with these believers before turning his gun on them, have left me numb. I'm grateful for the many who have already written and spoken eloquently on behalf of those who sorrow with Mother Emanuel, especially on behalf of us grieving brothers and sisters in the Body of Christ worldwide. Through their words and tears and prayers and solidarity, the "God with us" of Emanuel's historic name is being lived out. Jonathan Freedland of the Guardian newspaper commented on two of the most eloquent speakers, Jon Stewart and Barack Obama. He observed that "both the presenter and the president struck the same tone. They matched each other in weary resignation." Resignation. Maybe that's a state similar to my own numbness. ... One of the most counter-worldly things we can do—and perhaps one of the greatest threats to the established order of this broken world—is to be faithful and committed to the study of the Scriptures as a community, taking in the Spirit’s power and direction to live out the Gospel of peace, truth, and divine justice in the face of human and spiritual fallenness. To gather in study, praise, and prayer is a radical rejection of the norms and preoccupations of a consumerized and morally stricken society. In this sense, the people of Emanuel AME Church were doing work that put them at additional risk. They were gathered for nourishment in hope and power, in direct opposition to a world urging us to become angry without action, fearful without freedom, and despairing without direction. Based on what I've learned of Emanuel AME Church's history, I believe that the church already knows this to be true on an elemental, visceral level. Living in the faith and practice of "God with us" doesn't guarantee safety in any worldly sense, despite the comfort and security that some of us in Christendom have come to believe is ours by right. I close my eyes and see scenes of Hebrew scholars being kicked and taunted by Nazis in the buildup to Hitler's holocaust. I see the mushroom cloud over Japan's "most Christian city," Nagasaki. I even see Christians killing Christians in Rwanda. And still there are those who keep the faith. How can we thank you enough? Are the emotional options limited to resignation and endurance? Is there a place for anger? On the BBC News Web site, a video clip entitled "Charleston shooting relatives: 'We feel nothing but love'" caught my attention. "In this extended interview with the BBC's Rajini Vaidyanathan, Chris and Camryn Singleton said they wanted to focus on moving on in a positive way. Their mother, Sharonda Singleton, 45, was one of nine people shot dead." 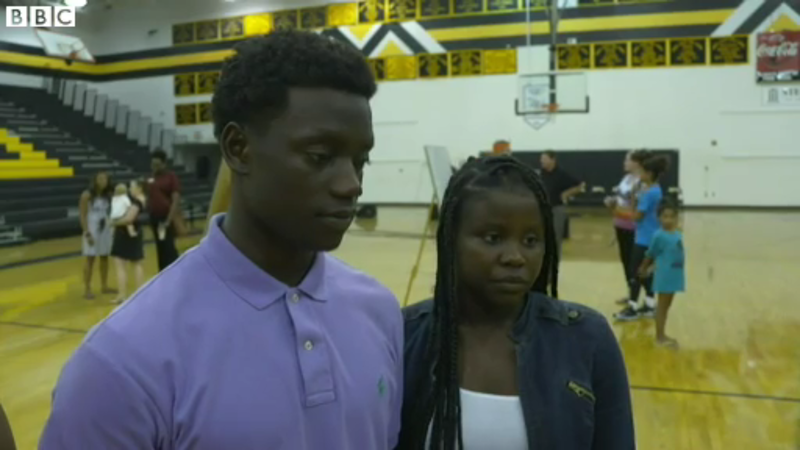 When these two teenagers say that they have already forgiven the shooter, the interviewer can hardly believe her ears. Meanwhile, their state's chief executive is already demanding the death penalty. If their ability to forgive (and they're not the only ones) is evidence of "God with us," I couldn't imagine a more powerful proof that Mother Emanuel's legacy is alive at this very moment. (Personally, I have been through this process with Tyrone King, the murderer of my own sister, when I was eighteen.) I unreservedly honor their testimony against hate. Still, I humbly want to insert a tiny footnote on behalf of anger: the Holy Spirit is competent to deal with anger, but church culture generally isn't. I hope that we don't abandon those who find that anger isn't a phase they can pass through easily. Finally, a word to those who talk about the real nature of the crime in Charleston as being an "attack on Christians." This line is being ridiculed by some commentators as an attempt to divert attention from pervasive racism as well as resistance to gun control, and to exploit the tragedy for the political purposes of those who trade in the "Christians as victims" theme in U.S. politics. But, on the face of it, as an expression of racism, this massacre was very much an attack on Christian faith, as is racism in all its ugly forms, the exaltation of violence, and all the other ways we objectify each other. They are incompatible with Christianity! A couple of posts ago, I mentioned Charles Spurgeon's phrase, "the virus of sin." By analyzing the Emanuel tragedy in terms of our own favorite scapegoats -- the lone racist or racists in general, or persecutors of Christianity, or liberals, or conservatives -- we miss the point: the virus of racism and violence is likely in us, too. We need "God with us" desperately, NOT to distinguish us from the ungodly or any other scapegoat, but to confront this virus.